It’s rare for Tesla to disclose its sales per market, but it looks like they couldn’t resist the opportunity to highlight the Model S’ market performance in the U.S. during the earnings this week. The company confirmed 25,202 Model S sales in the U.S. in 2015, which gave the company a 25% market share, while every single other large luxury sedan has seen its sales decrease during the same period. It gave me the idea to look into the midsize luxury segment in the US, which is the segment the upcoming Model 3 is expected to compete in, and see what it would look like if the vehicle was to do as well as the Model S did in the large luxury segment. Now I’m not saying it will do as well, but I’m saying it is certainly a possibility worth looking into, especially considering the now apparent impact the Model S had, and presumably is still having, in its own segment. The U.S. is one of Tesla’s most well-penetrated market, making it perfect for this exercise, even though Tesla CEO Elon Musk said this week that Tesla has still room to grow in the market, especially in the Northeast, which he called “quite under-penetrated”. 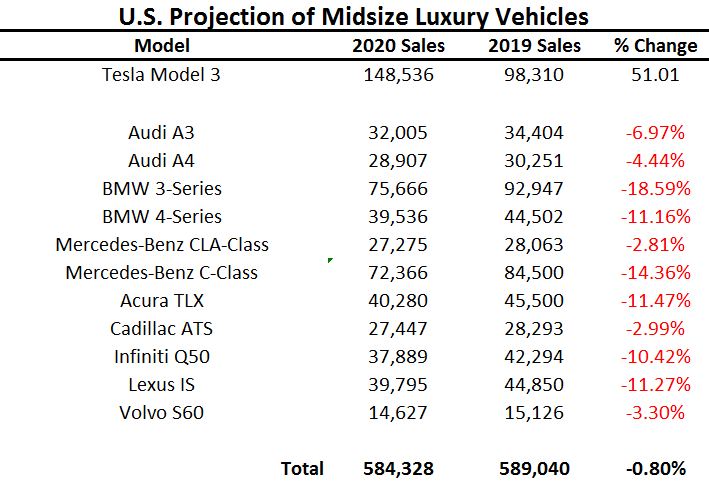 I gathered the same data from the manufacturers and created a similar chart but for the midsize luxury sedans segment, in which the Model 3 is expected to compete. 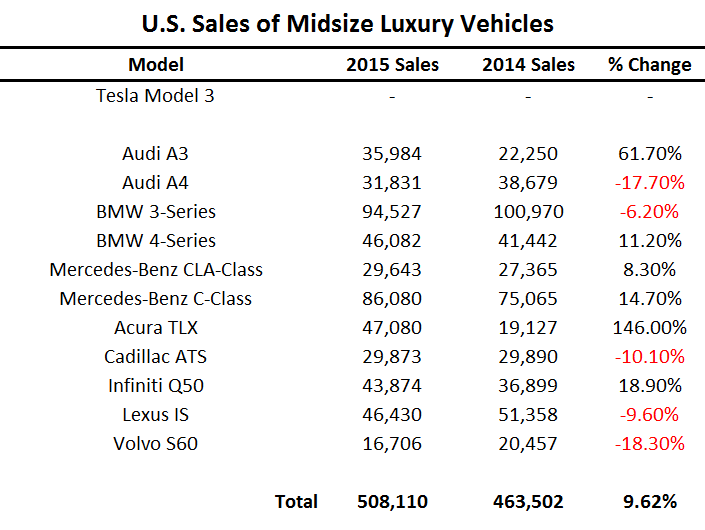 As you can see below, it’s quite obviously a much bigger market than the Model S’ segment, actually about 5 times bigger, but also, while the large luxury sedan market didn’t grow last year, the midsize luxury sedan saw an important increase in sales of almost 10%. Then I used the same data to make some projections and see what would happen to the segment if the Tesla Model 3 does as well as the Model S did last year. I projected the sales into 2019 and 2020 because if Tesla is on time with the Model 3 launch in late 2017, in term of production ramp up, 2019 and 2020 become to the Model 3 what 2014 and 2015 were to the Model S since it launched in the U.S. in late 2012. Now of course the segment is not likely to have all those same models 3 and 4 years from now, but it still gives us a pretty good idea of the market. Those automakers are expected to come out with electric vehicles themselves, but most of them plan on launching plug-in hybrid versions of their existing models, which often results in more sales cannibalization than gains in market shares. Based on this projection, if the Model 3 was to have a similar production ramp up as the Model S based on its total market capacity, and perform as well in its segment as the Model S did, Tesla could sell close to 150,000 Model 3 units in the U.S. in 2020. In the past, Tesla’s management talked about hoping to be at an annual production rate of about 500,000 units per year in 2020. If you account for oversea markets (Europe, Asia, etc.) and Tesla’s other models, it’s not too difficult to imagine the company having plenty of demand to cover a capacity of 500,000. Honestly, I’d be more worried about the production scaling up to meet it. 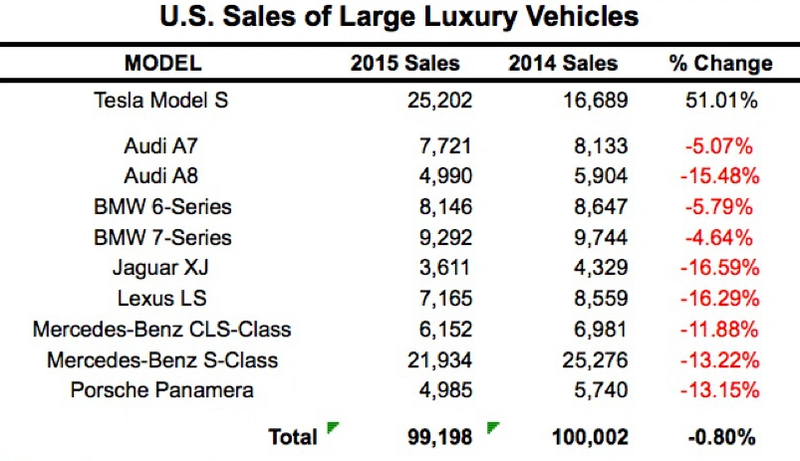 Of course to achieve such success, the Model 3 needs to be as compelling of a vehicle in its segment as the Model S is in its own segment. We should have a much better idea about that after the official unveiling on March 31st.